Saturday night’s 2012 Super Rugby final between the Chiefs and the Sharks at Hamilton is a fitting climax to what has been a terrific tournament. One of the best features has been that on any day, any team can defeat another. This trend continued in the semi-finals. Neither bookmakers (who put their money where their mouths are) nor pundits (who just offer their mouths) could see past a Stormers-Crusaders final. A typical commentary was that of Michael Lynagh, a shrewd player and informed commentator, who went on the record before the semi-finals to declare that the Crusaders would win the entire tournament. His grounds for making this claim were that the Crusaders have been the best team in Super Rugby in winning finals. What we saw at Hamilton on Saturday night was an end, at least until a rebuild takes hold, of this undoubted Crusader ascendancy. The great Richie McCaw and Daniel Carter, who are the heart, soul and muscle behind so many Crusader triumphs, just can’t carry the rest of the players. Embattled coach Todd Blackadder was moved to express his disappointment with the many All Blacks in his side who could not rise to the occasion. But, in my view, part of this is due to Blackadder’s coaching. He took over a side that the year before, in 2008, had won its seventh Super Rugby tournament. This was Robbie Deans’ last Super Rugby campaign, and the last of his five tournament wins as a coach. Under Blackadder, the Crusaders have been a finals side, but not the finals-winning side. When you looked at the way the Crusaders played against the Chiefs, the immediate thing that strikes is that the Crusaders are playing to the exact game plan that Deans worked out for them. In four years, Blackadder has not added anything tactically. He has introduced or poached gifted players like Israel Dagg but failed to get value out of them. The Crusaders need a new coach. Well-coached sides are beginning to work out how to defeat the old game plan. It is significant that a change in the coaching staff marked the rise and rise of the Chiefs. Dave Rennie, along with former All Blacks coach and selector Wayne Smith and forwards coach Tom Coventry, has given the formerly flaky, unstructured Chiefs the systems, plays and nous to make them the most formidable of the New Zealand teams. The Crusaders were taken by surprise (but why?) by the rushing, hard-shouldered Chiefs defensive pattern. Every time Carter got the ball he seemed to be surrounded by Chiefs defenders. I thought that the Crusaders actually played too flat (a big concession on my part for I am an advocate of the flat back-line system). At the end of the match, when the Crusaders needed a dropped goal or penalty to take the game into extra time, they were driven back 20 metres and into their own half by the ferocity and accuracy of the defence before a handling mistake was made. What I look for in coaches is whether players improve under their supervision. 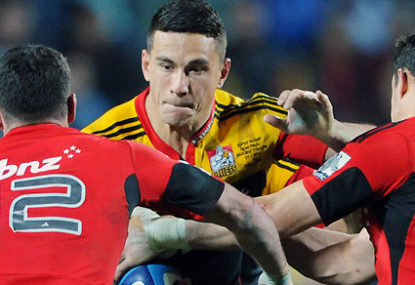 Three key Chiefs, Aaron Cruden, Liam Messam and Sonny Bill Williams, have taken their games to a higher level than previously this season. Messam, in my opinion, has cemented his place in the All Black side as the successor to Jerome Kaino. Certainly his play against the Crusaders was right up to the McCaw standard for loose forward play. Cruden (and let’s say this very very quietly because it is such an unlikely outcome) is probably the best number 10 playing in New Zealand right now. And Williams was just awesome against the Crusaders. What a pity that he is being lost to international rugby just at the time when he promises to be one of those players of a generation. The confrontation between SBW and JP Pietersen, easily the outstanding player on the field in the South African semi-final, will be titanic. Pietersen playing in the centres and sometimes on the wing for the Sharks has been totally outstanding. He is big, fast, and has a devastating step which he used to split the usually impenetrable Stormers defence to score a decisive try. His defensive work is just as outstanding. It was fitting, somehow, that at the end of the match when the Stormers were hot on attack, looking for a converted try to take the match into extra time, it was Pietersen who made a tremendous clean-out that knocked the Stormers off a tackled ball, exposing it for the Sharks to pick up and boot into touch. The issue for the Sharks is whether they can maintain their energy after yet another trip from South Africa to this part of the world, with Brisbane two weeks ago and Hamilton this coming weekend. They are going to spend most of this week in Sydney before flying on to Hamilton on Thursday. This makes sense. The key for them will be to start as vigorously and effectively as they did against the Reds and the Stormers. In both these matches they were able to establish a handy early lead which they were able to defend, even though for long periods their line was under intense attack. The Sharks play the most balanced game of all the South African sides. Their defensive work is strong. They have a goodish lineout and strong enough scrum (although their front row comes up a lot without being penalised). They have a lot of energy and verve in their attack. With Pietersen in the backs and Bismarck du Plessis in the forwards, they have two game-breakers who can turn a losing match into a winning one. All this adds up to a cracking final.